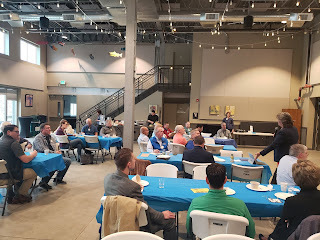 Wenatchee Sunrise Rotary Club (since 1986) Every Tuesday at 7:00 am, join us at Pybus Market, 3 North Worthen St., in the Local-Tel Event Center. You'll hear a friendly greeting, accompanied by a warm smile and a handshake. We are an organization made up of professional business people whose main goal is service through our friendships and our vocations. Come see what we are all about. May 1, is the All-Service Club Luncheon at the Convention Center. Cost is $25 per person. Keynote speaker is Melissa Arias, who oversees the strategic direction and operations for Make-a-Wish Alaska and Washington. April 16, 5:30 pm for the Bike Ride Committee meeting at Bob's Classic-Wenatchee. April 22, 23, 9 am to 1 pm, the Wenatchee Library is temporarily relocating, and needs volunteers to help move books and equipment those two days. 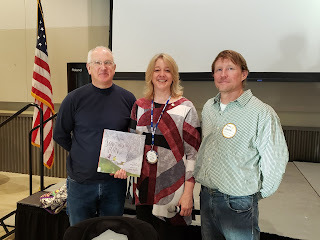 Our club has a connection to the Library with our donations of children's' books donated in the name of the speakers at our club. Please help out, if you can. Some heavy lifting is involved, so plan accordingly. April 23 we will have the Apple Blossom Festival Royalty as our speakers! Bring family and friends. April 27, 8:30 am is the start of the 100th Apple Blossom Festival Youth Parade starting at Triangle Park. Volunteers are needed to help marshal the parade. Please contact Allan Walker. Pj said that Ron Griffith needs help with some yard work. 1316 Kittitas St., Wenatchee, Friday April 19th @ 9 AM. Alan and his wife sold their house. Ruth's daughter did fantastic at her gymnastic tournament! Kathleen said the round tables have been ordered. Joseph had the honor of telling the Chuck Norris joke this morning. 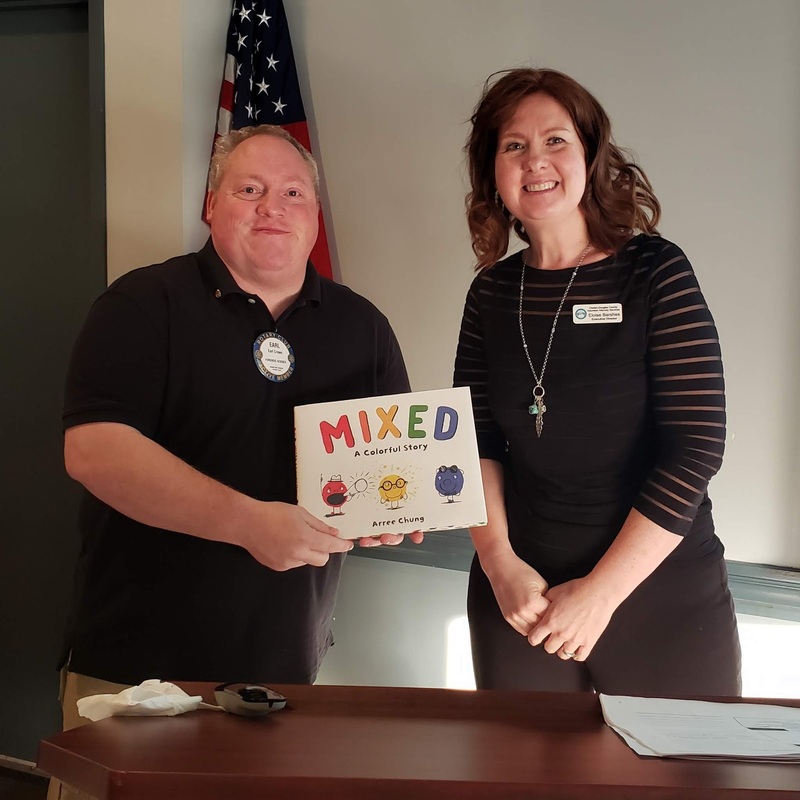 Wayne had a great time at the men of rotary meeting he went to. PJ had a great trip and he leaves again on Monday. Jim Huffman gave his speed classification talk this morning and did great. Rest of the meeting was spent with our committees. District Governor Sherry Chamberlain and husband Jim opened the meeting with a program on Membership Engagement. - How do we engage new members? Induction, take them to coffee, have them give a classification talk. - Why is membership engagement important? Retention, new member feels connected and valuable. - Committees. Very important that all club members sign up for one or more committees. A committee of 1 is not a committee! Ask a new member to sign up for one or more committees. Committee meetings should be fun!! Follow through after the committee meeting to complete a committee plan of action. Report back to the club from the committee meetings. 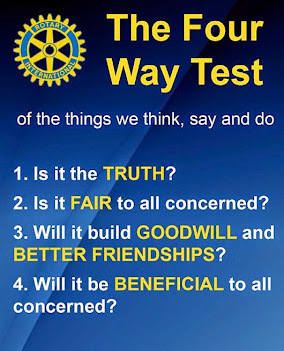 - "Give back to the Community" is the number one reason people join Rotary. When members get inspired, they produce results, and stay in Rotary. 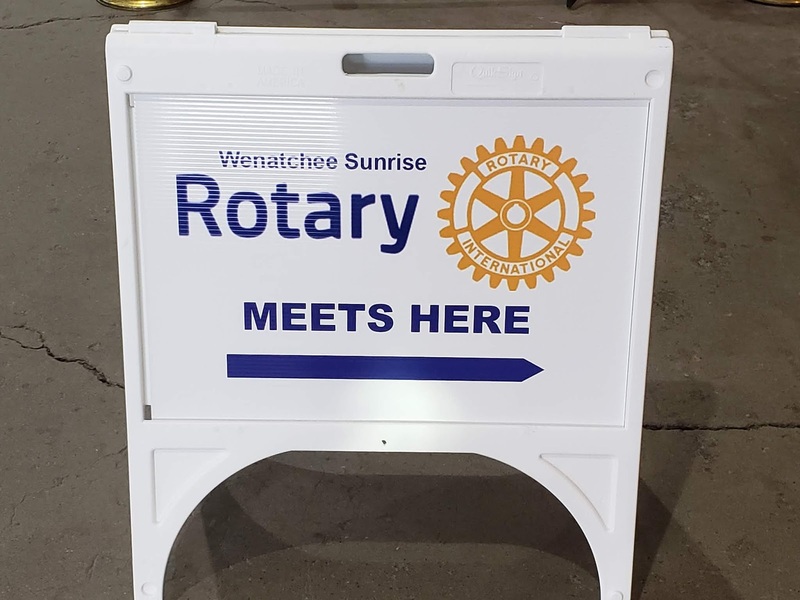 President Lisa announced that Wenatchee Sunrise Rotarian Jenny Rojanasthien will be leaving our club and going to the evening club. April 10th is the second gathering of Women in Rotary in our area. Bring prospective members (women or men). Norwood Wine Bar at 5:30 pm. April 10th is also when the Men in Rotary have an impromptu get together at Badger Mountain Brewery at 5:30 pm. May 1, is the All-Service Club Luncheon at the Convention Center. Cost is $25 per person. Keynote speaker is Melissa Arias, who oversees the strategic direction and operations for Make-a-Wish Alaska and Washington. Contact Carol Adamson if you missed the sign up sheet. We have two tables for our club. 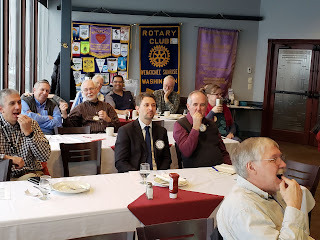 April 13, 14 are the days for Rotary Leadership Institute (RLI) in the Wenatchee area. Several of our club members are attending. April 16 we will have Classification Talks. April 27, 8:30 am is the start of the 100th Apple Blossom Festival Youth Parade starting at Triangle Park. Volunteers are needed to help marshal the parade. Please contact Allan Walker if you wish to help out and see the parade up close! Wed., May 1, is the All-Service Club Luncheon at the Convention Center. Cost is $25 per person. Keynote speaker is Melissa Arias, who oversees the strategic direction and operations for Make-a-Wish Alaska and Washington. Contact Carol Adamson if you missed the sign up sheet. We will have two tables for our club. May 2-5 is the District 5060 Conference in Kamloops, British Columbia. 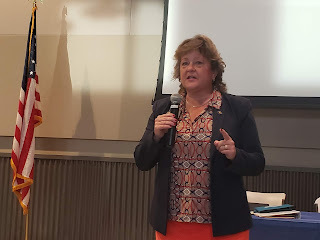 Three days of Rotary fellowship, leadership training, and district updates! All Fun! Several of our club members are attending! 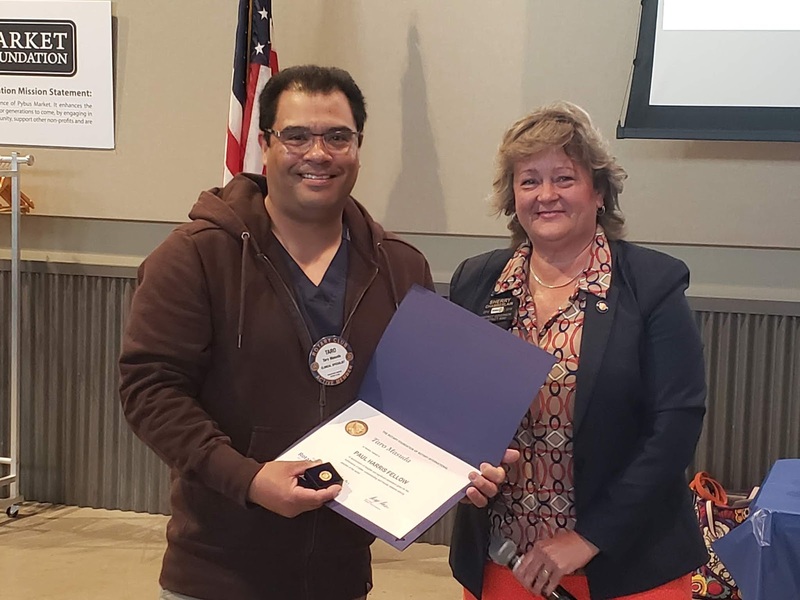 District Governor Sherry Chamberlain presented President-Elect Taro Matsuda his first Paul Harris Fellow award. The PAUL HARRIS Fellow is an award given to those who have given $1,000 dollars, possibly over several years, to our Rotary Foundation. It is one of the most prestigious awards in Rotary and thereby named after the founder of Rotary, Paul Harris. 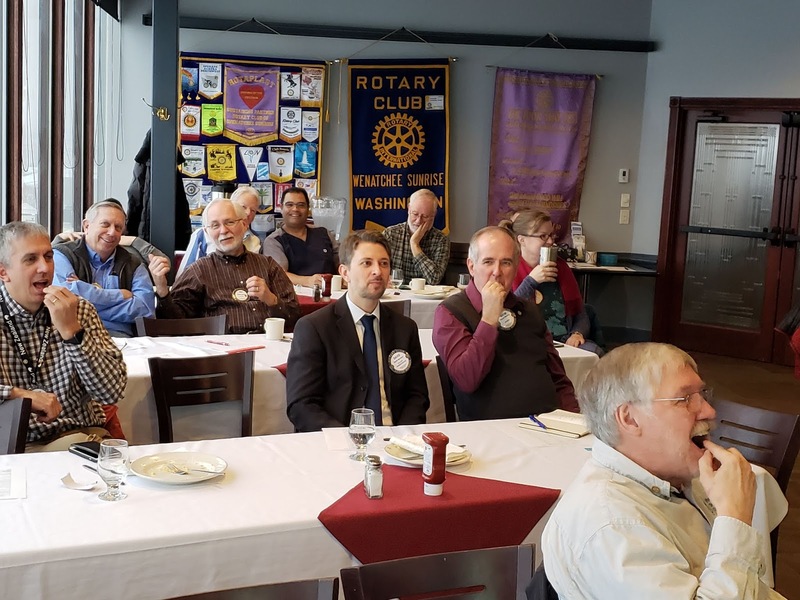 Giving any sum of money to the Rotary Foundation makes you a part of the eradication of Polio, a partner in creating PEACE, a person who supports Clean Water and Sanitation where water is worth more than gold, and it is measured in LIVES. President-Elect Taro Matsuda presented Club President Lisa Parks with her second Paul Harris Fellow award. She was short a few points from getting it, but the Wenatchee Sunrise Rotary Club Board of Directors voted to help her achieve the award! Jim Huffman shared a new Chuck Norris joke. He's still awaiting a laugh! 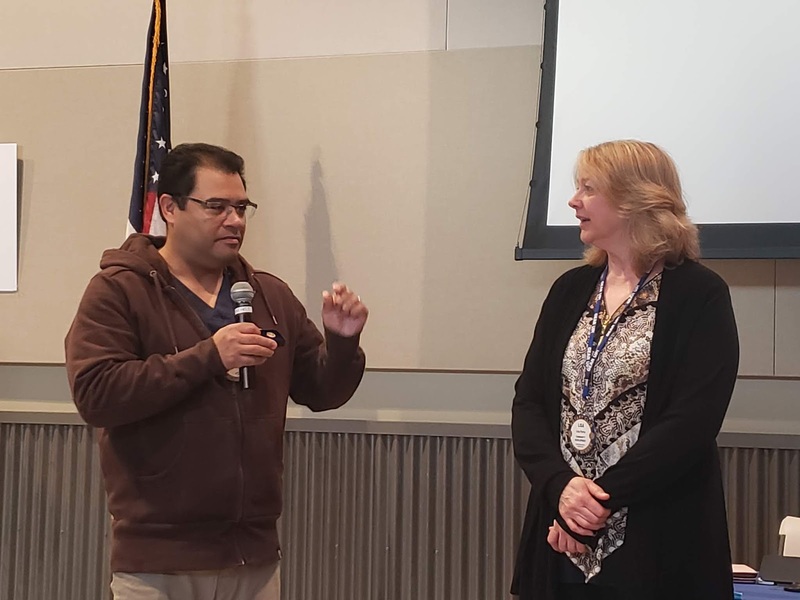 Mansour Ravassipour shared his recent travel plans, and said he was glad to be back in Wenatchee, even for such a short time. Chris McDarment shared Joseph's tennis schedule. If you can attend and cheer him on, please do so! -Tuesday, April 30 @ 3pm vs. Eastmont. Lisa Parks said she had FUN back in her life, with fly fishing, guitar playing ,and motorcycle riding, all shared with a significant other! Jim Adamson shared accomplishments and awards of his grandkids. Davis Barshes said he was a Lego-Land Hotel survivor! Craig Reeves showed us some colorful, handmade bags, some full of coffee. The soup bowl trivets were both functional and colorful. He raffled off items to support his Burundi school. Craig Reeves and David Barshes, co-chairs of the Challenge Scholarship Program were our program speakers today. They showed a video that our club had produced highlighting how people's lives had been changed by our Challenge Scholarship Program. They said that the funds available for the scholarships had been set at $12,000 for two years of college and 2 years worth of books (paid at 50% of the books). They discussed the Mentoring Program which helped the selected students through high school and into college. 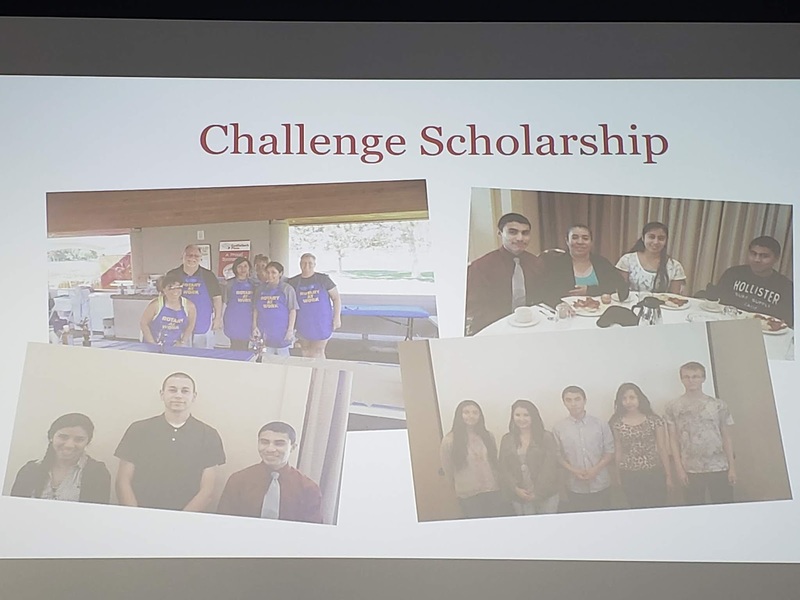 Our Challenge Scholarship Program is so successful that the East Wenatchee Rotary Club was using ours as a model to start their own program. Each year 25-30 applicants apply for 2-3 scholarships. Earl Crowe is the chair of the selection committee, and he is looking for volunteers to be on this committee. Contact him if you're interested. See April birthdays and anniversaries in the right hand panel. 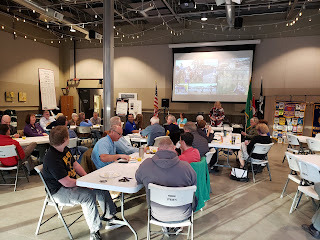 Our new venue at Pybus Public Market, Local-Tel Event Center continues to be a great meeting place for our growing club! Come join us any Tuesday at 7 a.m.
Steve Robinson, Executive Director of Pybus Public Market welcomed Wenatchee Sunrise Rotary Club, the first Rotary Club to meet in the newly renovated Local-Tel Event Center. 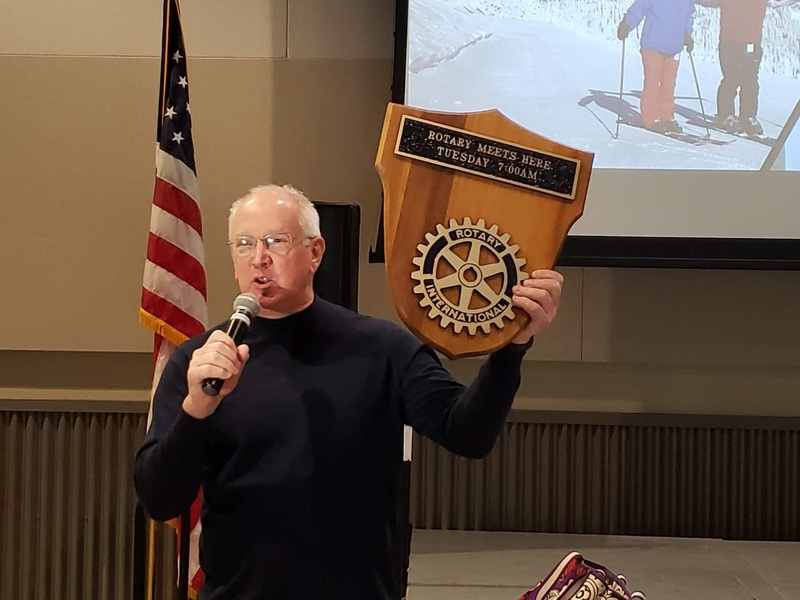 Steve holds a Rotary plaque that says "Rotary meets here every Tuesday 7 A.M.", which will be prominently displayed within Pybus. 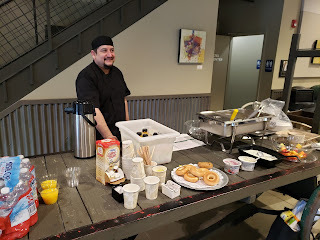 Adrian's Cuisine provides us with a delicious breakfast. Our first meeting, club members enjoyed "Mimosas" to celebrate a festive meeting at Pybus Public Market. April 10th is the second gathering of Women in Rotary in our area. Bring prospective members (women or men). Norwood Wine Bar at 6:00. Bike Ride committee to meet April 16th @ 5:30 at bobs in Wenatchee. Alan is looking for volunteers for the Apple Blossom Youth Parade on April 27th @ 8:30am. Meet at Recreation Park. We will be parade marshals along the route. Wed., May 1, is the All-Service Club Luncheon at the Convention Center. Cost is $25 per person. Keynote speaker is Melissa Arias, who oversees the strategic direction and operations for Make-a-Wish Alaska and Washington. Contact Carol Adamson if you missed the sign up sheet. We will have one or two tables for our club. Erin's b-ball team (Virginia) is in the final four. Of course they are successful because of their coach, who they stole from WSU. Chris is back from Florida where he visited his brother, who is in the military there. Wayne celebrated his mother-in-law's 90th birthday. Erik is a first time grandpa, thanks to his daughter giving birth to a baby girl. Joel spent time in Penticton at the Youth Exchange outbound weekend. Kathleen is back from her trip to Arkansas. Jim A bragged about his 7th grade grandson taking first place in a junior high wrestling tournament. Steve Robinson, Pybus Director, talked about where the market has come from over the past 6 years. 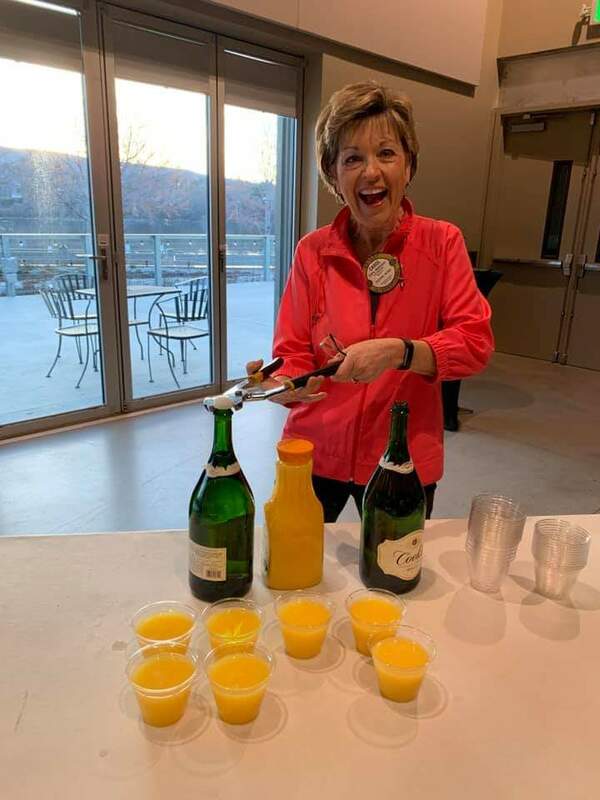 He also reviewed some of the many accomplishment in 2018, including the $1.5 M remodel of the Local Tel Event Center. Board member Darren Klingensmith gave information on the future plans, including turning the south lot into a plaza, and possible expansion to the north. We will be changing our morning meeting location to Pybus Market starting April 2. We will meet there for 8 weeks, and then decide if we want to stay longer. The cost is considerably less ($100/week). A buffet featuring a variety of food items will be offered for $10.25. Local Area Rotarian Directory has local advertising space still available. Contact John McDarment for rates. Alan is looking for volunteers for the apple blossom youth parade on April 27th @ 9:30am. John McDarment won the Bring A Guest prize drawing. Alan brought in a flyer for a group Spelling Bee Fundraiser on April 12th. Lisa has two Apple Valley Gymnast who will be competing in the Junior Olympic Program. Jill met with Mr. Tosh about the senior dinner and he only had good things to say about our group. With the program not showing we watched a TED talk on creative ways to get kids to thrive in school. 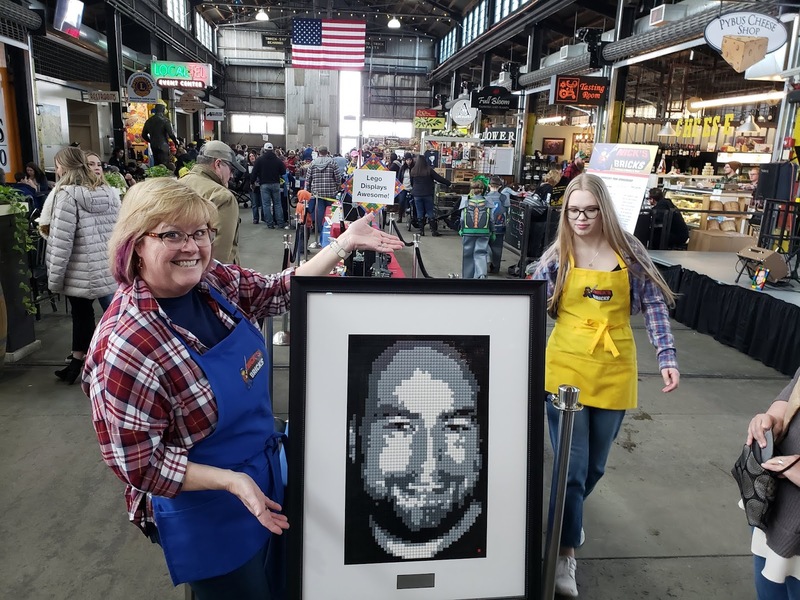 We will be changing our morning meeting location to Pybus Market starting April 2. We will meet there for 8 weeks, and then decide if we want to stay longer. The cost is considerably less ($100/week). A buffet featuring a variety of food items will be offered for $10.25. We will eventually be buying round tables for Pybus, and they will credit us that amount to our room costs. We are hiring a person to come in early to set up coffee, condiments, linens, etc. Wayne Massing announced the location for the training for volunteers for The Gorge's 2019 concert series. The one near us is Tues., May 7th at Link Transit, Columbia Station Ridgeline Graphics, 34 North Chelan St., Wenatchee (new location) 5:30-8:30 pm. Please contact Wayne to get on the list, if you need training. Those trained last year are certified for 5 years! 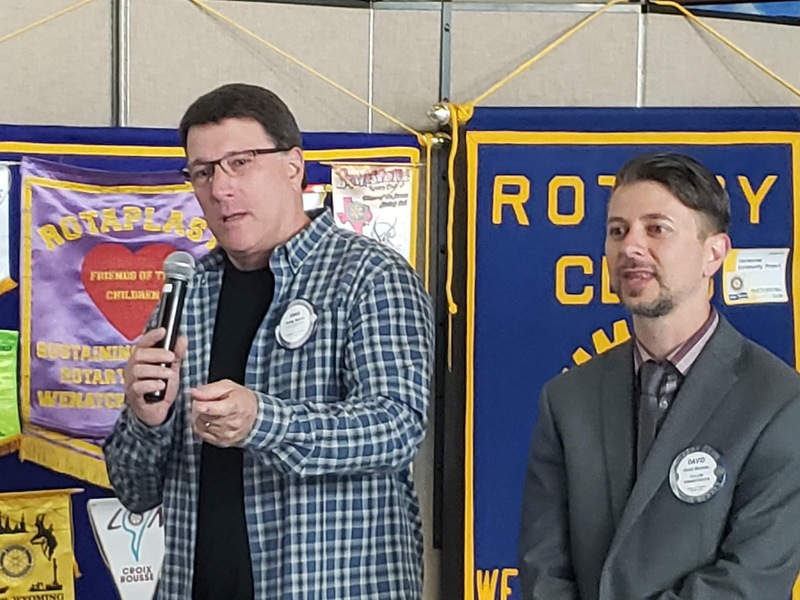 Earl Crowe announced that the Local Area Rotarian Directory has local advertising space available. See John McDarment for rates. Erin McCool announced that she had been absent for several meetings while conducting legal business, and supporting her husband Paul on his cross-country runs. 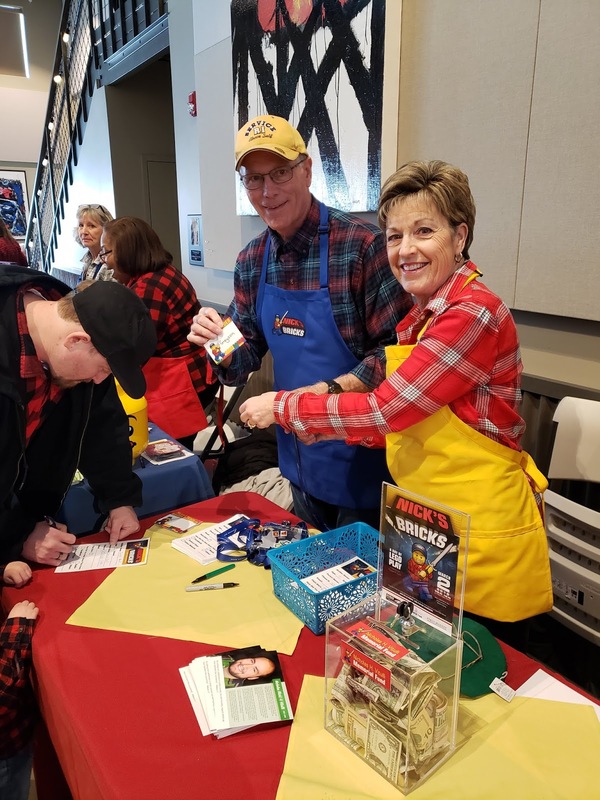 Jim Adamson announced that he and his wife Carol, along with Wayne and Karen Massing, attended a dinner and trivia contest at the Wenatchee Golf and Country Club on Saturday night. They took third place (out of four teams) and won their admission fees back! Wayne Massing announced that he and his wife Karen traveled to Seattle to visit her sister who is in the hospital there. They had dinner with their daughter and returned Monday. Taro thought he did a great job tuning and sharpening his son Reagan's Atomic Skis because Reagan won his ski competition! Way to go, Reagan! - VAS is part of the Alliance For Equal Justice" organization. Eloise announced the "Justice Gala" on Saturday, June 1st. Tickets for this event are $50/pp. 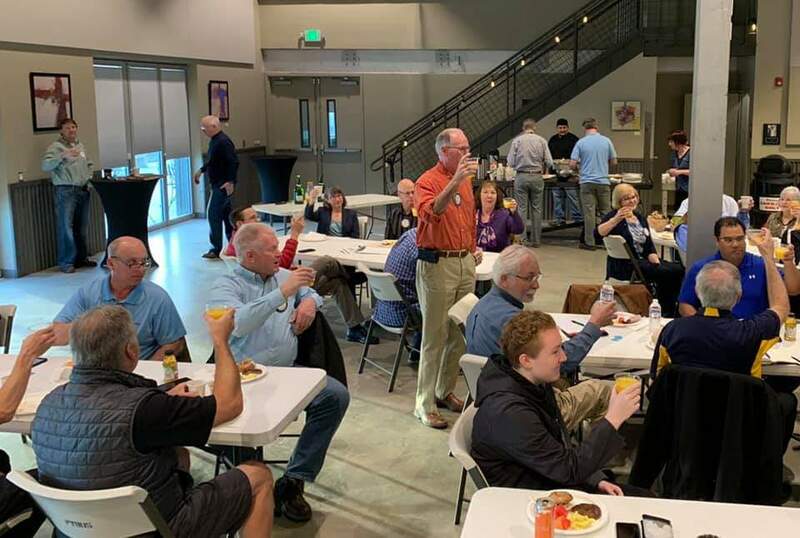 On March 28, 5-7 pm the Wenatchee Valley Chamber of Commerce will have its After Hours gathering at the VAS office at 300 Okanogan Ave., Suite 3B, in Wenatchee. Light appetizers and drinks will be served. The meeting was adjourned at 7:50 a.m.
Board Meeting notes - It was decided that we will be changing our morning meeting location to Pybus Market starting April 2. We will meet there for 8 weeks, and then decide if we want to stay longer. The cost is considerably less ($100/week). A buffet featuring a variety of food items will be offered for $10.25. We will eventually be buying round tables for Pybus, and they will credit us that amount to our room costs. We are hiring a person to come in early to set up coffee, condiments, linens, etc. It was decided to change our Challenge Scholarship amount (which has varied depending on when and where credits are taken) to a flat $12,000 over two years. $5,000/per year for tuition and $500/per year for books. Bike ride committee will meet Tuesday, 3/19, at Bob's Burgers & Brew at 5:30. 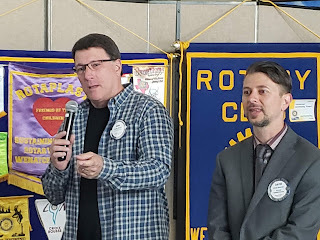 Wayne Massing announced the locations for the training for volunteers for The Gorge's 2019 concert series. Tues., April 2nd, 5:30-8:30 pm at Chelan Chamber of Commerce, and Tues., May 7th at the Link Transit, Columbia Station, 5:30-8:30 pm. Please contact Wayne to get on the list, if you need training. Those trained last year are certified for 5 years! PJ Jones returned from his ski adventure/work in the Grand Tetons. He injured his leg, and only was able to ski after extensive Physical Therapy. He and Cookie decided to tie the knot and get married on March 1st! Jim Adamson returned from Edmonton where he gave several speeches at that region's PETS (President-Elect Training Seminar). He had a 10 hour commute time getting there! Rebecca Lyons bragged about getting on a plane at Wenatchee Pangborn Airport and the temperature was 9 deg. F. When she arrived in Mexico, it was 90 deg. 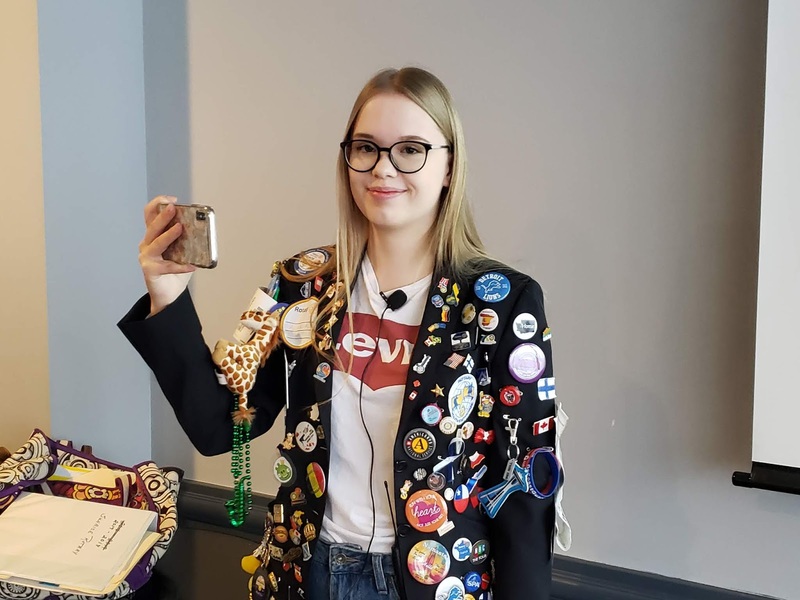 F.
Alina, the Youth Exchange student from Finland, gave a great program that outlined her experiences in our community, and gave information about Finland. Everyone got to sample some licorice-like treats from Finland (see picture). 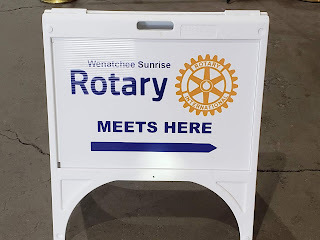 Alina is being hosted by the Wenatchee Confluence Rotary Club. She has had a wonderful experience so far, and has seen many places and gone to many events. She gave several examples of how different and difficult the Finish language can be. The words "Kuusi Palaa" have 9 different meanings. The REAL Santa Claus is from Finland, Alina says! She has met him! In Finland, the meat balls are just meat: no sauce like ours! 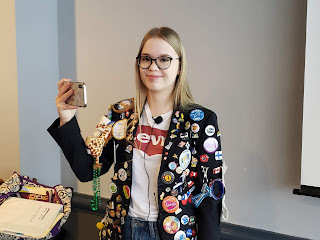 Alina is enjoying her Youth Exchange time in the US, and thinks that many of her friends and classmates at home would enjoy it, too. 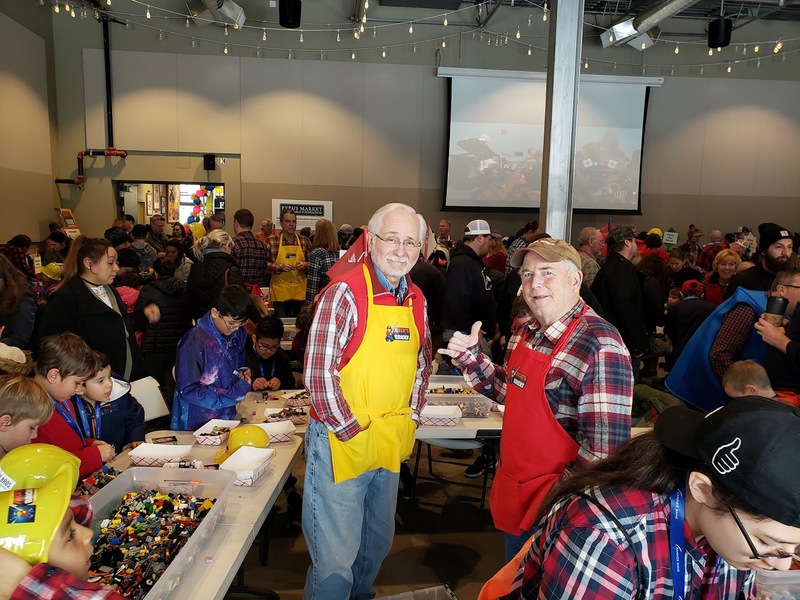 Some of our members helped out at the 2nd Annual Nick's Bricks event at Pybus a couple weeks ago. The event is in honor of Nick Vituli (age 24) who died while hiking in Africa. He was into Legos, and his parents started this event to honor him, and spread the joy of Legos to kids in the valley. They have also set up a foundation to keep the event going. Nick's dad, Kevin, was the president of Wenatchee North Rotary (now Confluence) two years ago. 3) attending a fellowship event, service project, committee meeting, or other Board sanctioned event. Turn your make-ups in to John Schapman, or write them down on the attendance sign-in sheet by your initials.